The most recent addition to CPO’s quest to bring the little-known German composer Heinrich von Herzogenberg to the forefront of classical music awareness is this, his Christmas Oratorio. 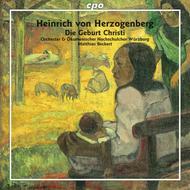 Far more than just a Brahmsian imitator, Herzogenberg’s Die Geburt Christi truly reveals his myriad skills for charismatic vocal writing. The oratorio is for four-part choir, six soloists, harmonium, string ensemble and an oboe, and is based on the Bible, hymnbook texts, and Boehme’s folk songs. The appearance of the one oboe in the third part, when the shepherds and children are hurrying to the manger, produces a moving poetic effect as well as a humorous one, so that the work undergoes an unexpected intensification beyond that normally induced by the appearance of Seraphim.